Huddinge has a large indoor shopping mall. So what's the big idea here? 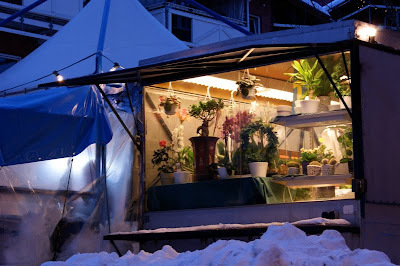 Selling flowers in the snow droves immediately outside the comfy mall - I just don't get it. I agree, not a great idea. Maybe they're testing if the flowers can withstand the cold. Sort of an Arctic botanic benchmark.